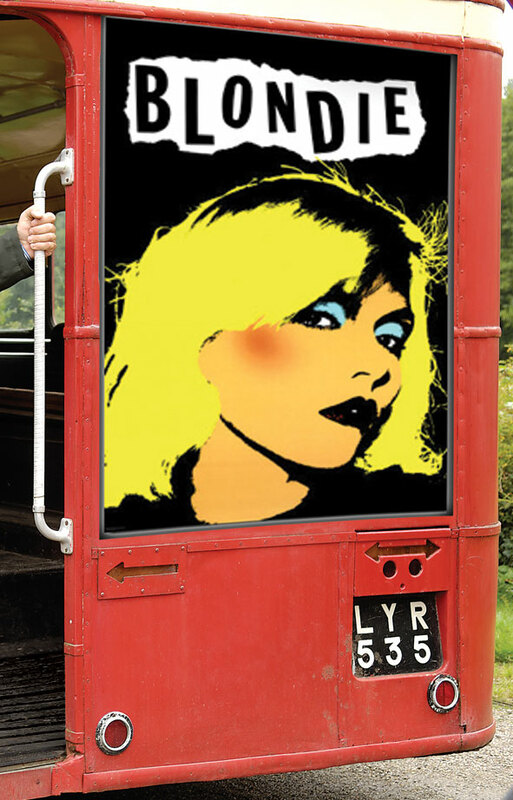 Debbie Harry (The Sunday Girl) is 68, Keith Richards is 69, Johnny (Rotten not Boden) is 57. Yes, the grey market is the new rock n roll. Time was we would be talking bus passes and stairlifts – Thorah Hurd and Raymond Baxter – but now we have to include trekking in Tibet, botox and viagara, Helen Mirren and Rod Stewart (though not necessarily in that order). The demographics show we are getting older but the psychographics tell us the mature market is FEELING younger. So here are our Top Tips on creating advertising that empathises with the grey market. See our gallery for examples of current clients advertising to the grey market. At ECMOD round tables I often ask the audience who is their favorite Doctor Who. It’s a light hearted way to gauge the age of the audience, splitting them into the Tom Bakers, Sylvester McCoy’s and Matt Smith’s. It’s a good ice breaker. But I will also gain some insight into the character of my audience. I can glimpse behind their cybermen masks. What will be your icebreaker to your customers? It is important not to group them all together. The 55 to 64’s (our rock n rollers) won’t see themselves as old at all. So your products, images and age of models, should reflect this and guard against ‘grey’ cliches. The 65 to 74’s (I think of them as the younger and wiser’s) will have a different mindset again. Be patient but don’t be patronising, be it in your copy or the style of telephone response – it’s a big turn off. Be honest and straight forward, avoid the hype. The over 60’s have definitely seen it, done it and washed the T-Shirt a thousand times. In Social Services categorisation you are not officially ‘OLD’ until you are 80. Your actual age no longer defines you as it once did, so don’t just think in terms of ABC1 Septuagenarians and Octogenarians (sounds like Dr Who aliens again). Think of your audience as real people, with real needs and desires. So how do you create a dialogue wit the tribal elders. Back to the Tardis.. Tip 1. Do some Time Travel. 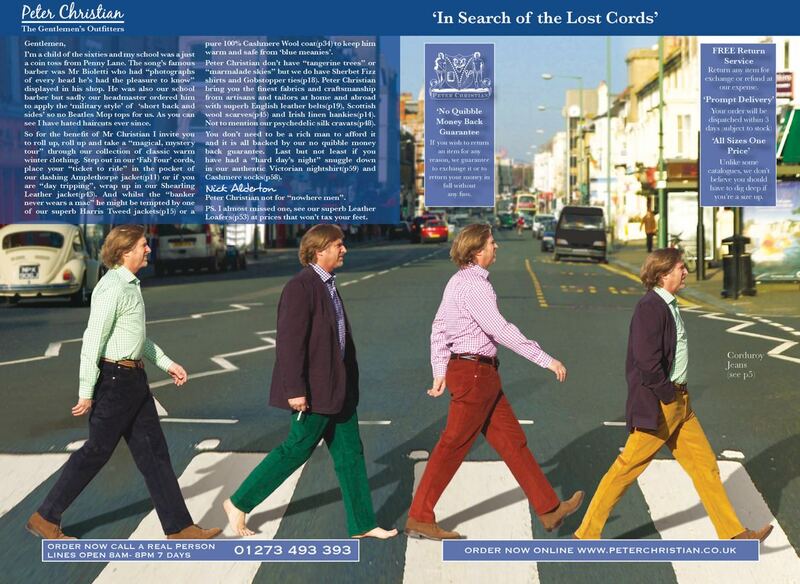 Peter Christian Catalogue – Crossing Abbey Road! A 65 year old guy with a bus pass in 2013 would have been born in 1948, with a ration book. But he would have been in ‘his pomp’ at twenty in 1968. So his prime cultural references would be The Beatles, Mini’s (cars and skirts), ‘Not only but Also’. Leap forward in time and he is as likely to be reading Uncut magazine as he is Saga Magazine. For each group you will find some milestones – it might be a book, an advert from the period, a song, a TV or radio programme. The 50 plus sector are the generations keeping the national press afloat. They have time to read copy (if you have the time to write it). See our report on press circulation figures for the 65+ audience. The editorial content of the press is a quick way into each group. Whether you are an advertiser or not magazines are very revealing.Saga Magazine circulates 591,223 magazines monthly (ABC). A readership of 1,318,000 with 70% over 65 – that is amazing customer loyalty, that you can buy into. Saga’s cover won’t be a model it will be a real person. 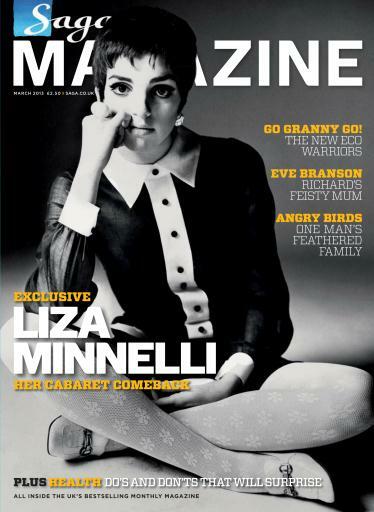 You will find a Daniel Craig sandwiched between Felicity Kendal and Liza Minnelli. It’s not about ‘knitting patterns’ any more. You find articles on Silver Gamers and expensive Exotic Travel, whilst still serving traditional editorial fare like the Wisden anniversary. With thousands of magazines published in the UK, you have an entry into any niche. For example the ‘Mr Bridge’ Catalogue is the the bridge players ‘bible’. Don’t be put off by the Mr Marple vibe, it has a circulation of over 300,000. That’s a pokey number of potential older and affluent customers. Buy the popular magazines in your sector. (Don’t use the web, it’s important to make this a physical thing). Pour yourself a glass of red or a cup of moccachoccalattechino, settle into your sofa and flick through the mags. It’s a treat isn’t it. Just you and YOUR mag. You will also be receptive to that advertisement. Now back to business…Lay your Women’s Mags out in a row and ask the question where do you position your brand? Eg; Are you Cosmo, Red, Women’s Weekly, The Lady. Then ask the question what type of new customers do you want. Finally which magazines are your competitors recruiting from. You will find this a surprisingly insightful experience. The ‘silver surfers’ are very active in the Blogosphere consuming and creating the content. They have more time to read and write than the under 50’s. It seems like an age ago now but Friends Reunited kicked this all off. The Mature Market are quite at home with Social Media. Read the blogs on your sector. (Friends Reunited is incidentally owed by DC Thomson publisher of People’s Friend and My Weekly!). ‘I look pretty young but but i’m just backdated’. Pick out the cultural ‘icons’ of your customers. Stick them up on the office wall. You now have a the same ‘point of reference’ as your customers. If you want to speak your customers language then read your Feefo’s. It is that easy. Whether it is bouquets or brickbats, Feefo testimonials are written in the customers own language. This is where you can find your own authentic voice, a turn of phrase and gauge how far to take a sense of humour. DJH have always had respect for our elders, cutting our teeth on DM campaigns for McCarthy and Stone (that was 20 years ago). We now run campaigns for Carr & Westley, Rowlands Clothing, Crew Clothing, Agriframes, Wentworth Puzzles, The Good Life Guide and Elderberry. We also designed ECMOD award winning catalogues for Peter Christian. See our creative gallery with a selection of client advertisements targeting the grey market – Creative Ads for the Grey Consumer. If you are looking to recruit the right mature customers “call me” (as Blondie might sing!) to chat through your brief. And if it is media targeting you need, see our report on magazine circulations for Top 65+ titles.